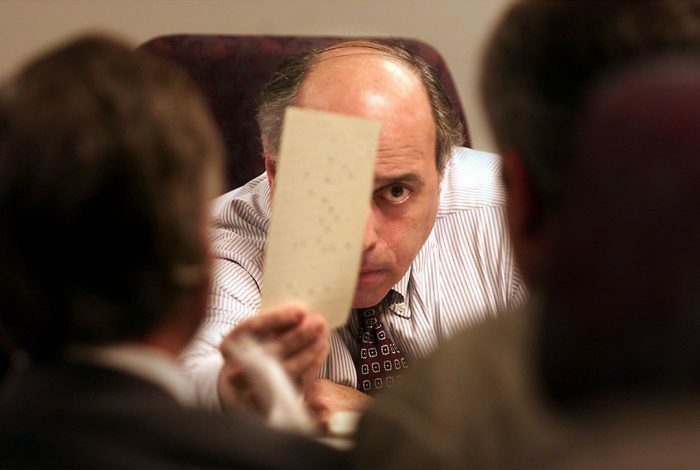 Broward County Canvassing member Judge Robert Rosenberg presents a ballot to a team of observers during the county's hand recount on Wednesday, November 22, 2000. Photo credit: © Detroit Free Press/TNS/ZUMAPRESS.com. Florida is in the spotlight once again — as it is in nearly every election it seems — undergoing multiple recounts to determine who will be its next governor and US senator. And, once again, the process is incredibly messy, tensions are high, and election officials don’t seem up to the task. This all brings back memories of what happened in the presidential election between George W. Bush and Al Gore in 2000. The world was glued to TV screens as partisan election officials, state lawmakers and judges, and, ultimately, the US Supreme Court decided who would be the next president. The chad referred to the bit of paper on the ballot that voters were supposed to punch through to indicate which candidate they preferred. Some chads didn’t completely punch out, but instead hung on the back of the card. When the ballot was then read by the machine to determine how the citizen had voted, sometimes the chad — when placed on the bed of the machine — would fall back into place in its original hole, making it appear as if the citizen had voted for no one. The narrative from some in the GOP was that the fault lay with the voters themselves who hadn’t fully punched out the hanging chads. The unspoken — and dubious — implication was that the voters in those (blue) counties didn’t follow instructions or were just stupid. But what if something more sinister was at work? What if the hanging chads were not a bug but a feature? What if the paper could be engineered in such a way that certain chads for certain (blue) counties could be made to hang in such a way, while others punched out cleanly? That’s the very mystery investigative journalist Stephen Singular wanted to get to the bottom of. Is that in fact what happened in Florida? And, if so, who was behind these paper ballots? Where and how were they made? 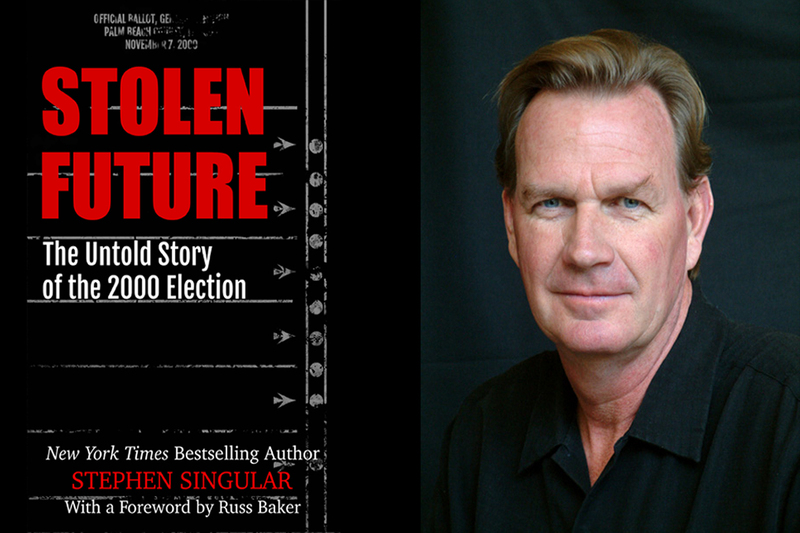 Stolen Future: The Untold Story of the 2000 Election by Stephen Singular. Photo credit: WhoWhatWhy. Singular sought to find answers to all of these questions. 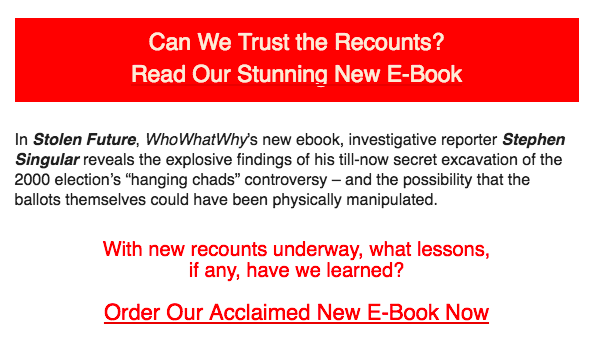 And he tells us all about it in his new book Stolen Future: The Untold Story of the 2000 Election, just published by WhoWhatWhy. In the following excerpt he relates his troublesome partnership with CBS’s 60 Minutes, and the struggle to bring attention to what he had discovered regarding the hanging chads. Jack and I had reached a crossroads. I felt we had to do something and do it fast, with the inauguration just about two weeks away. I couldn’t do this alone — I didn’t have the clout to make it work. We believed that the cards in our possession needed to be tested much more thoroughly — a very expensive proposition — before we could draw any conclusions. So I suggested we bring in outsiders with more resources to carry the process forward more quickly than we could. With the pressure on, it seemed like the best choice. Of course, you can’t know ahead of time how these things will turn out, and certainly no one knew then where the Bush presidency was heading. But I think now that my sense of urgency was right. Once the big decision was made, the next step seemed obvious. Might as well go straight to the top, I told myself, of televised investigative journalism. I dialed the number for a producer in Los Angeles who’d worked freelance for CBS’s 60 Minutes. This individual called Mike Wallace, the veteran star of the program — who was vacationing in the Caribbean. Wallace gave the green light, which didn’t surprise me. Roughly two months after the polls had closed, his network had delivered a very public, self-flagellating apology for its election coverage the previous fall. The “Tiffany Network” had offered up a huge mea culpa, asking the American population to forgive it for indicating that Al Gore and not George W. Bush had won Florida. What if CBS hadn’t been wrong? What if something else was at fault? Would the network now have a special desire to redeem its reputation by committing itself to looking behind the façade of the 2000 election? CBS had a lot at stake in these circumstances, so offering them some information seemed like a relatively simple proposition — my first mistaken assumption. 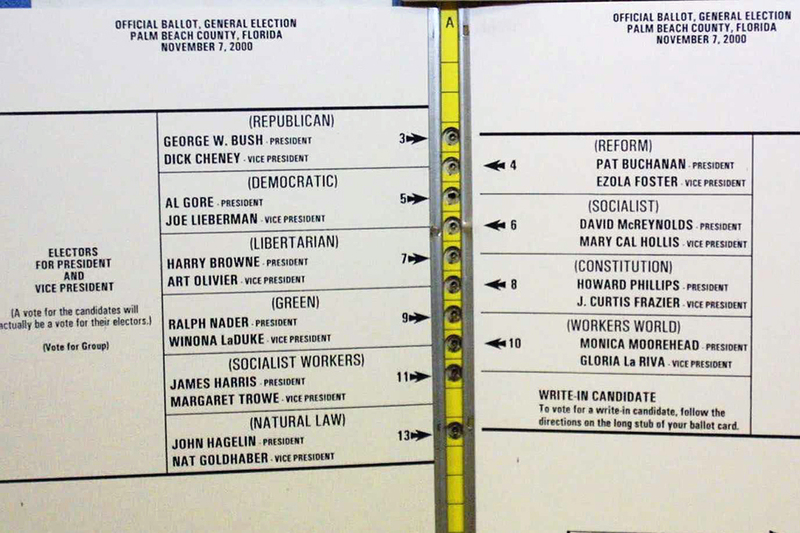 Official ballot for the 2000 United States Presidential election from Palm Beach County, Florida, November 7, 2000. Photo credit: Anthony / Wikimedia. Did I expect to receive any credit from CBS for my legwork on the story so far? “Well…” I said to the producer, not quite sure how to respond to this. Would I demand any form of recognition from 60 Minutes for kick-starting the investigation with my original inquiries in Colorado and then traveling to Florida to get the cards? Or for gathering more information since then? Because if I needed any credit — any credit at all — this story would be “the biggest fish” the producer had ever had to throw back in the water. If a show on this subject aired on CBS one day, the producer said, Mike Wallace would never give credit to another journalist for generating the foundational material behind an investigation or point out the steps taken before such information reached his desk. If I accepted their terms, from this moment forward it would be a Mike Wallace and 60 Minutes production — no one else’s. I couldn’t tell anybody else in the media what Jack and I had been doing and I couldn’t do any more investigating on my own and I had no control over anything that would happen next. Did I have a problem with that? I explained that I was not looking to get publicly clapped on the back by the shining lights at CBS, but rather seeking a mutually beneficial arrangement with a large news organization that had far more money and power than I could muster. A major media organization needed to act on this story now and I’d come to them first. I’d be willing to give them additional information and in return I hoped that they could get their hands on more cards and run more tests and get more answers, as soon as possible. 60 Minutes might get a great show out of all this and I could learn things that would otherwise be hard to discover or to prove — by myself — and perhaps I’d write about this later. A ground-shaking segment on CBS could lead to more important developments, such as congressional hearings into what had really happened on November 7. That, in turn, might prevent something like this from invading and infecting the election process in the future. And no telling what effect this could have on a Bush administration still in the process of picking its cabinet members. Given everything, 60 Minutes seemed like the best option on the table. A “get,” for the uninitiated, occurred when the program could line up some very negative facts against a company and then bring in Wallace to blindside the organization and one or more of its key executives — zap them on national TV before they’d had the chance to prepare a defense. Embarrass and shame the corporation when their pants were all the way down — and then get out of town. The bigger the get, the better for CBS. To facilitate a “get,” the network didn’t want me speaking with anyone about the cards — and they absolutely did not want me snooping around any ballot manufacturers. If the producer or Wallace got wind of something like that, they’d pull up stakes and bolt. The story was now theirs alone and I was to back off and let them get it done. They’d likely have something ready for prime-time Sunday viewing, maybe as soon as the sweeps in February. Believing all of this might actually be true was my second mistake. Tests had been run on the cards but… they needed something else, something more… an individual to step forward now and tell Mike Wallace exactly how the punch-card system worked and what had taken place prior to the election in Florida… an on-camera confession from an insider who could bring clarity to a rather mechanical and technical set of issues… if I couldn’t help the show find this person and get him or her to talk on the air, then I was useless to CBS. Just for the record, I wasn’t offered a nickel as incentive. The winter of 2001 was fading and CBS hadn’t aired a story on the Florida voting mess and my patience was running out. Living in Denver, I was too far removed from the action in New York to have a clear sense of what was happening, or not happening, with the story. All the while, I’d been repeatedly commanded by the producer to sit on my hands and do nothing. But I’d never been worth a damn at taking orders — and had no intention of starting now.